These are the sweet, cakier breads: brioche, challah, kugelhopf, rum baba. Lots of eggs and butter! It was such a whirlwind of a day, I'm still trying to sort it all out. Brioche is best made the day before you want to use it but, since we didn't, we had to make it quickly in the morning and get it started. We made one and a half of the large recipes of it, so I cracked 32 eggs for it! (Each student got a different ingredient as we were making a communal batch.) 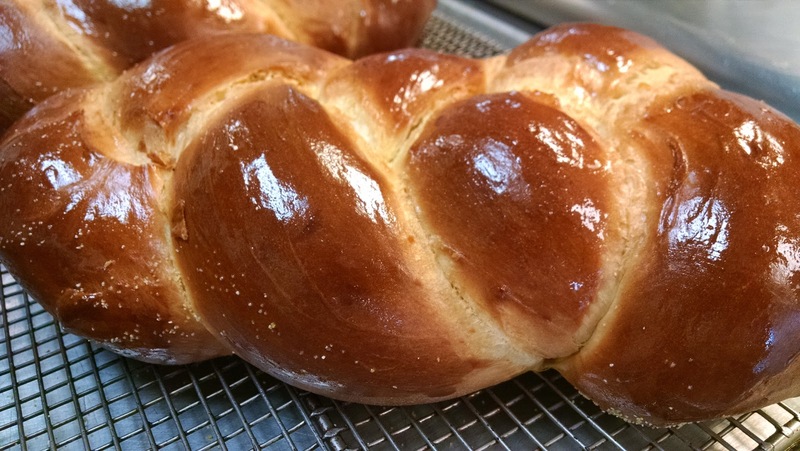 While that was doing its thing, my partner and I made a sponge (yeast-flour-water prefermentation) for the kugelhopf and made the challah dough while it was fermenting. Then we mixed the dough for the kugelhopf and both of those were set aside. The kugelhopfs everyone made were mixed together in the end and placed in molds that were buttered and sprinkled with sliced almonds. 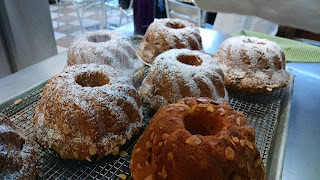 After that, my partner and I made the dough for the babas while another group made the dough for the savarin (similar dough, different shape, no raisins). Lastly, we made a pain au lait along with one other group while the other 2 groups made baguette viennoise. Along the way I also made a simple syrup for the babas and the savarins. 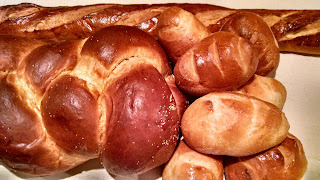 Someone else made a batch of pastry cream which was used with the brioche dough to make fruit brioche and cinnamon rolls. First the brioche dough was divided in half, and the first half rolled out. Pastry cream was spread on the dough and then it was sprinkled with chopped candied fruits (oh, yeah, we all had to chop those up, too: red and green cherries, angelica, papaya, orange and lemon peels), then rolled and sliced like a giant jelly roll. The other half of the dough was divided and rolled into circles and placed into rings. Then the fruit roll slices were arranged in the dough base in the rings and this was allowed to proof. The rest of the dough scraps were rolled together, coated with more pastry cream, and sprinkled with cinnamon, sugar and chopped pecans. This was also rolled like a jelly roll and sliced, and the slices were placed in muffin cups. The challahs were braided and proofed, washed with egg wash and baked. The kugelhopfs were taken out of their molds, cooled and dusted with powdered sugar. The babas and savarins were baked and cooled, then the babas were soaked in syrup with rum and the savarins in syrup with kirsch. 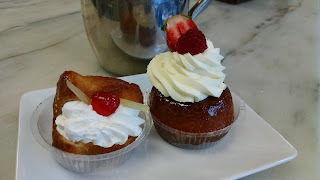 These were set aside until we could make the chantilly cream and mousseline cream to fill them. The baguettes viennoise were rolled to look like the regular lean baguettes, proofed and baked. The fruit brioches and the cinnamon rolls were accidentally put into too warm an oven so they got a little extra browned but they are still quite tasty. Everything had egg wash on it before it went into the oven, for extra color. The pain au lait were made into little finger sandwich rolls, with snips made with scissors to make the tops visually interesting. They looked like a little herd of hedgehogs! After all this sweet dough, we had a little break and then went on to knife skills. This is the point when we got our chef knives and learned how to care for them and use them. We practiced making batonnets by making french fries, which were dinner. We also got to julienne and then brunoise zucchini, oblique cut some carrots, mince garlic and convert it to a paste, chiffonade some lettuce, and julienne onions as well as cut up oranges and lemons. The french fries were delicious!